The Carmelite Institute needs your support. 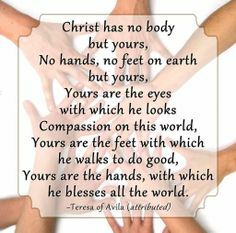 First of all, we need your prayers to our good God to “give success to the work of our hands.” Christ is the foundation of the Carmelite Institute. Without his aid and protection all will be in vain. No amount of money creates spiritual success. No amount of money can make God present or nourish his life within us. No matter what retreats, talks, or missions are given, in the end it is all His work. All good comes from Him and returns to Him. Prayer to Him is the foundation for any spiritual endeavor. He is the foundation of the Institute. After Christ, our Foundation, we need a community of Pillars from and off of which ministry may take place. Another way, if you are of mind and heart, is financial. The Institute receives no financial assistance from any organization. Our only source of regular income comes from our “Pillars”. Unlike going to a lecture or talk and giving $15.00 for what we receive, this request is for people to support the very existence and idea of the mission of the Institute and receive nothing in return, not like having a Mass said or attending a lecture. $15.00 or more a month is a small amount, but hopefully, you will be inspired by God to do this. A person, couple, or family that financially supports the Carmelite Institute of Spirituality on a regular basis is a Pillar. This support gives the Institute stability and the ability to pay utilities, expenses and take care of maintenance needs, etc. How can I become a Pillar? The pillars are the backbone of the Carmelite Institute of Spirituality. Please prayerfully consider your invitation to become a Pillar. Accept your invitation and fill it out. You will get occasional updates on the plans of the Institute and be put on the mailing list for newsletters. While we do have a beautiful meditation garden, it takes a lot of maintenance. Please pray about the possibility of volunteering your time to help pull weeds, rake leaves, participate in the garden cleanup parties and all the other things that come with maintaining our houses and gardens. We are a Discalced Carmelite Community committed to prayer and apostolic service. Our mission is to foster and encourage spiritual growth to all who are looking for a deeper union with God through Spiritual Direction, Days of Recollection, Retreats, assistance to Parishes and support to OCDS groups (Lay Carmelites) and the Carmelite family. From Interstate 5, take Exit # 212 (SR 532) and proceed west toward Stanwood/Camano Island for about 4 miles. Go past the schools and take the next left, 78th Avenue NW, and drive to the end of the street. St. Cecilia Church is on the right. Park in the parking lot and walk back two houses to the Carmelite Spirituality Center - the only house on the street with a red tile roof.